Local history shows that the area around Saratoga has been prized for centuries. Native Americans hunted the abundant wildlife and bathed in the therapeutic hot springs; they fished the rich North Platte River. It wasn't until 1838 that the first white men came to the area - mountain men and trappers working their way west. The local hot springs had been enjoyed by Native Americans for centuries, and the settlers quickly began "taking the waters" for health. 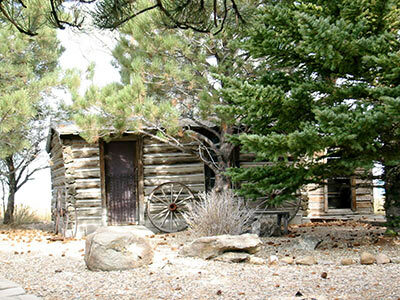 It wasn't long before a cottonwood log structure and bathhouse were erected near the springs to accommodate visitors. Today, the affectionately named "Hobo Pool" and hot springs are still open free to the public, all day, every day, year round. When you come to an event at the PVCC, be sure to save time to soak in the springs. The town was called, not surprisingly, Warm Springs, until it was renamed in 1884 to honor a resident's fond remembrance of Saratoga Springs, New York. The town thrived, and 1884 saw the construction of the Saratoga House hotel, which burned down only 18 years later. In 1893, The History Hotel Wolf, a three-story structure made of local brick, was built as a stage stop. Considered quite elegant at the time, it is still open for travelers today, its Victorian glory restored. In July of 1907 the first locomotive rolled into Saratoga on the tracks of the new Saratoga and Encampment Railroad. A month later, thrilled residents threw a party the local newspaper described as “probably the biggest success of its kind ever pulled off in Wyoming.” An estimated 3,500 fried trout were served up for supper. Today, the North Platte River holds a reputation for unexcelled trout fishing, in part because the Saratoga National Fish Hatchery was established north of the town in 1911. It produced a variety of eggs -- brook, rainbow, brown, golden and cutthroat trout -- and continues to operate today. Timber has always been important to the economy of the region, and a sawmill (near the location of the present-day mill on Bridge Street) was built in 1934, and it operated for many years. Saratoga has remained vital into the 21 Century, with tourism serving as the number one industry. Exploring the town and enjoying outdoor adventures in the North Platte Valley will add extra fun for those attending your event here. A short drive away, the town of Encampment, along the Encampment River, was originally a rendezvous place for traders and trappers. Native tribes also used the area as hunting and fishing grounds. Encampment became a town and grew rapidly when copper was discovered in the Sierra Madres, just above the settlement. Unfortunately, years of growth and prosperity came crashing to a halt when copper prices fell in 1908. A subsequent series of smelter fires led to many residents leaving. 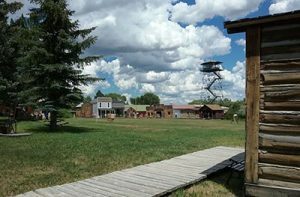 Now, with a population of approximately 450, Encampment is both a historic treasure, and a fine jumping-off place for both summer and winter outdoor recreation. Fishing, rafting, skiing and snowshoeing are popular. And the history museum, as well as annual arts and history events continue to bring tourists into town. Only two miles from Encampment, this tiny town of less than 60 residents was first settled by the ranching Swan family, and then purchased for one dollar in 1900 by Newton Doggett. The area bore those two family names until the town of Riverside was established in 1902. Always an agricultural and logging area, today Riverside is known for hunting, fishing and outdoor activities. You'll find several campgrounds and cabins for visitors. 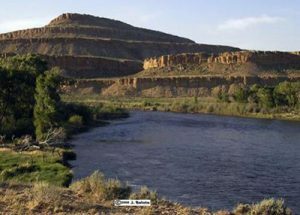 The Upper North Platte River Valley is a network of three small towns surrounded by majestic mountains and spread along the confluence of two free-stone rivers. There are traces of prehistoric peoples in hundreds of sites along the North Platte. Native American tribes, including the Shoshone, Crow and Arapaho, made their way into Wyoming before white traders and trappers discovered the riches to be found there. In the 1800s, the North Platte River Valley was an important westward route as the United States expanded from the East. You can still see traces of the Oregon and other trails in the wilds of the local landscape.